The ukelele is an unlikely blues instrument, particularly when it takes centre stage as lead instrument on a bluesy album. But then, there aren't many ukelele bluesmen like Manitoba Hal. An accomplished blues guitarist, Manitoba Hal Brolund began to flirt with the sonic possibilities of the ukelele back in 2008, eventually recording three ukelele albums in addition to seven earlier guitar-based recordings. His latest, Flirting with Mermaids, is a testament to just how far you can push a normally lighthearted instrument like the ukelele into the deep dark depths of the blues. You can be forgiven for swearing on a stack of bibles that you actually hear lots of blues guitar on Flirting with Mermaids, but in reality only one song, the gospel track Keep On Singing, features Manitoba Hal on guitar. Otherwise it's all ukelele on centre stage. On some tracks, including a couple of instrumentals, Manitoba Hal keeps it light, showcasing the traditional high playfulness of the ukelele, but on others, he uses some innovative looping to coax an earthy blues guitar sound out of the tiny instrument. The prairie boy turned salty blue-noser has a warm rich voice that equally complements both the heart-felt blues numbers and the quirkier tunes. 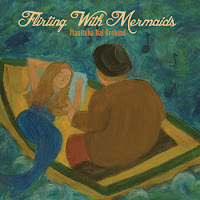 Flirting with Mermaids features primarily original tunes mixed with some great blues covers. Manitoba Hal's treatment of a couple of Mississippi John Hurt standards, as well as Tom Waits' Down in the Hole, Big Joe Williams' Baby Please Don't Go, and Merle Travis' Sixteen Tons, all demonstrate the surprising power of the ukelele, in the right hands. Mermaids and blues ....could morph into an entirely new genre. Keep us posted. Barb you know I have a soft spot for the uke. Interesting! It takes a lot for the uke to win me over, I'm generally put off by its cutesyness, but I will be giving this one a shot. Underwater jam sessions, perhaps? Could prove interesting, Rebelle! I thought of you while listening to this, Eugene. Definitely something you should check out. There are many times on this album when you would swear that ukelele is a raunchy blues guitar, BAP. Quite astounding.